A new poll shows that as President Donald Trump meets with Russian President Vladimir Putin at the G-20 summit in Germany, Americans say their feelings on the matter are complicated. 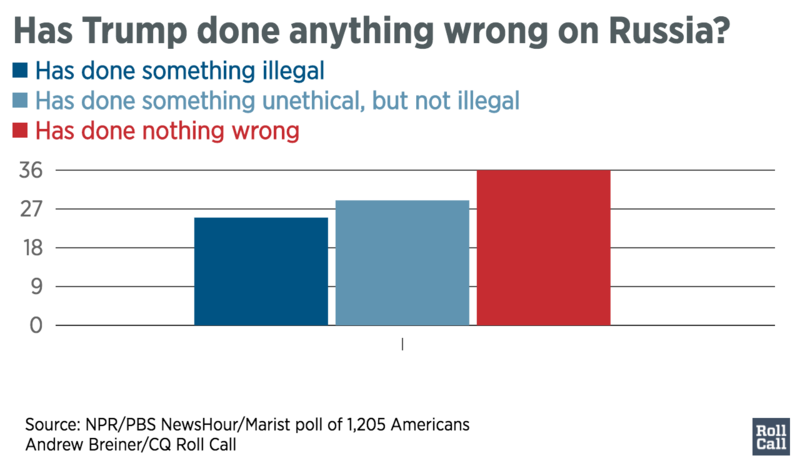 A NPR/PBS NewsHour/Marist poll of 1,205 Americans released Friday found a majority, 54 percent, felt that President Trump has done something illegal or unethical in his dealings with Russia and Putin, 36 percent said he&apos;s done nothing wrong, and 10 percent were unsure. That opinion split sharply along partisan lines, with 73 percent of those who identified as registered Republicans saying Trump hadn’t done anything wrong, and 80 percent of Democrats saying he had. But on the broader issue of relations with Russia, Americans don’t appear to be in a bellicose mood. Asked whether it’s better for the U.S. to build relationships with Russia or treat Russia as a threat, 59 percent said they want to build relationships, compared to 31 percent who want to treat Russia as a threat. Registered Democrats were more interested in treating Russia as a threat than Republicans, but 46 percent of them preferred building relationships, 2 percent more than those who favored taking a more aggressive stance. Republicans were far more interested in building relationships, with 67 percent in support. The poll also asked Americans whether Trump’s goal of improving relations with Russia was good or bad for the U.S. While a five percent plurality favored the goal, there was again a sharp partisan divide. 70 percent of Democrats said Trump’s goal of improving relations with Russia was bad for the U.S., and 75 percent of Republicans consider it good. Though a majority said of those polled said they were following the news, 40 percent said they were following news about Trump, his associates, and the Russia investigation,” not very much, or not at all. And responses about following the news was not impacted much by party registration. The poll was conducted June 21 to June 25, 2017, and the margin of error was 2.8 percentage points among all respondents and 3.1 percentage points among the 995 respondents who said they were registered voters.